Description: Tiny organic and inorganic dirt and debris that is too small for the typical filter to catch can cause cloudy swimming pool water. An unwanted and bothersome nuisance, these small particles can be difficult to remove. 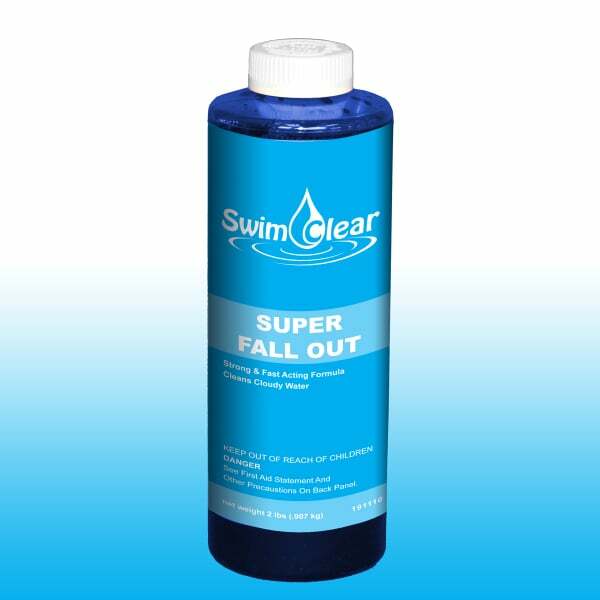 Super Fall Out by Swim Clear contains a powerful formula that settles out dirt and particles so they can be caught by a regular pool filter or vacuum. Function: This product will quickly and effectively flocculate organic and inorganic particles suspended in swimming pool water. The swimming pool filter and vacuum can then remove the cloudiness resulting in beautifully clear water. The pH must be 7.8 or higher for this product to work properly. Read directions on all Pool Supplies. Test pool water pH with a reliable test kit. Adjust pH to 7.8 or greater if necessary. For highly turbid water, dispense approximately 1 quart (32 ounces) per 40,000 gallons of water evenly over the water surface. Allow the pump to run for one hour and then shut off. Allow the floc to settle to the bottom of the pool overnight and then vacuum it out to waste. The maintenance dosage to prevent cloudy water is 8 oz. per 40,000 gallons of water once a week. Pour directly into the skimmer or around the perimeter while circulation system is in operation.